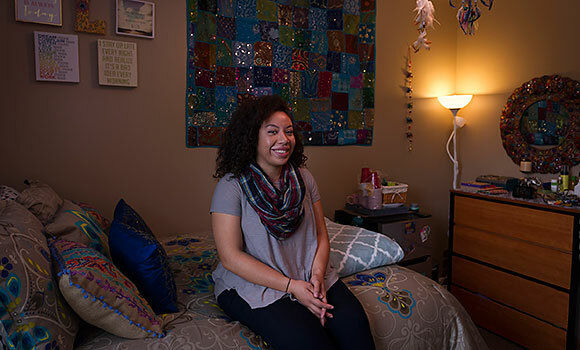 Junior Lauren Salazar's colorful space in Spring Garden Apartments won the grand prize for apartment/suite-style rooms. Gone are the days of decorating dorm rooms with a few band posters and a “We’re #1” foam finger. For UNCG students in 2015, creating a space that feels like home is an art form. This fall, 281 students in 180 rooms across 25 residence halls participated in the eighth annual Best Dressed Room Contest sponsored by the Office of Housing and Residence Life. The rooms were judged on style, creativity, attention to detail, best use of space and overall impact. Grand prize winners for traditional-style rooms Mariah Glynn (left) and Cameron Parker (right) show off their cozy space in Mary Foust Hall. Lauren Salazar, a junior communication studies major who lives in Spring Garden Apartments, was named the grand prize winner for apartment/suite-style rooms. Cameron Parker and Mariah Glynn, both freshmen in the Ashby Residential College at Mary Foust Hall, won the grand prize for traditional-style rooms. Freshman communication studies major Alejandro Lopez and his roommate Andrew Wentz, a media studies major, campaigned hard to win the Spartan Spirit Award, which recognizes the room that receives the most likes on Facebook. For Salazar, color was everything. Salazar wasn’t the only winner who incorporated bright colors. 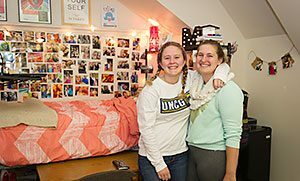 Lopez and Wentz highlighted the eclectic aspects of their room in Reynolds Hall – a Digimon poster, a life-size cutout of a Star Wars stormtrooper, tie-dye bed sheets and a hammock. 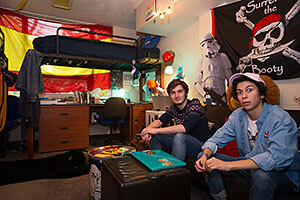 Andrew Wentz (left) and Alejandro Lopez (right) won the Spartan Spirit Award for their eclectic room in Reynolds Hall. Parker and Glynn decorated their space with lots of photos of family and friends, wall decals and, once again, color. Students went all out this year, incorporating monograms, streamers, wall-hanging rugs and comfy recliners in their designs. To enter, students completed an entry form and uploaded photos by Sept. 16. This year’s judges, a collection of coordinators for residence life and other staff members, selected one winner for each residence hall and two overall grand prize winners. The winners were announced at a reception on Oct. 14 in the Tillman Smart Room in Shaw Residence Hall. According to Kory Burgess, assistant director for marketing for Housing and Residence Life, the students take the competition very seriously. The rooms aren’t the only part of the competition that is impressive. This year’s prizes for the top two winners were valued at $400 – the residents of the winning rooms opted for the GoPro Hero4 Silver or an iPad Mini. The winners of each residence hall received an Apple TV or wireless speakers, and the Spartan Spirit Award winners each won a GoPro Hero3 White Edition. To learn more about campus housing and to view a list of upcoming events, visit hrl.uncg.edu.